The shop, located on the brewery site on Old Burcot Lane, is doing a roaring trade with those keen to enjoy Bird’s beer in their own homes, and customers can also buy a host of other local produce such as cider and perry, pickles, chutneys and sauces, honey, ice cream and even burgers. 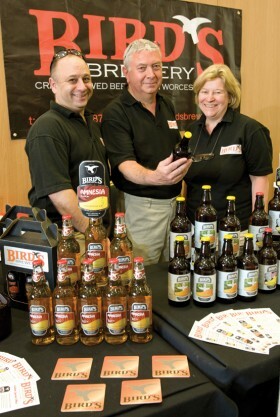 Bird’s, which started brewing in August 2009 and opened the shop in October 2012, was initially formed in order to supply the pubs owned by its sister company – but the brews proved so successful that they were soon snapped up by local hostelries like The Ladybird in Aston Fields, The Cross at Finstall and The Dodford Inn. There are seven regular beers – Amnesia, Apocalypse, Serendipity, Eureka, Natural Blonde, Thunderbird and Black Widow Stout – all of which are available to buy in bottles. Then there are the seasonal brews such as Summer Daze, Hocus Pocus, Chest Warmer, Sleighed, and the brilliantly-named Santa Claustrophobia – and Bird’s also created Mild High Club to mark CAMRA’s Mild Month this May. In celebration of the government’s recent decision to scrap the “beer duty escalator’ and reduce the cost of a pint by 1p, Bird’s brewed a special beer named Sajid’s Choice after the Bromsgrove MP. Three barrels were sent to the Strangers’ Bar in the House of Commons, where they sold out in just two days. Meanwhile, Serendipity was entered in the Sainsbury’s Great British Beer Hunt – it won in its regional section and will be on sale nationally in Sainsbury’s in September. If it proves popular, it could become a permanent fixture. If you’re planning a summer party or BBQ, it’s worth knowing that the Bird’s shop offers a five-litre mini keg, a 35-pint bag-in-box or a 72-pint firkin – perfect for introducing your friends to the best of Bromsgrove beer. Pictured: Karl Knibbs, Steve Hammond and Cynthia Hammond.